Last time we ranked the (currently) three films from directors JJ Abrams and Justin Lin that make up the Kelvin Timeline. Today, we’re going to look at the four films (from worst to best) that make up (and contain my favourite crew of the Enterprise) The Next Generation chapter of the film franchise. What can I say about Nemesis that hasn’t already been said? While it wasn’t as bad as Trek V (The Final Frontier) or as boring as Trek The Motion picture – it’s not a good film. The director made very questionable choices, there’s stuff that feels off, the writing isn’t that good. It just seems to be a bit of a mess. I’m not going to say that this movie killed Trek on the film front for a while – there’s a number of factors as to what led to the break (such as being on the air uninterrupted since 1987 and having a movie franchise that came out once every two or so years simultaneously leading to burn out on the staff front and less interest on the audience front) – but the movie being as flawed as it was didn’t help. That’s not to say there aren’t some good ideas in there (even if they didn’t turn out as well as they could have). The wedding of Troi and Riker is a great idea, Data sacrificing himself is good, Tom Hardy as a young Picard clone is a great idea (though flawed through poor direction in execution) – but that’s about it (Worf is just kind of there and along for the ride, at least the previous two movies justified it). For me this is easily the worst of the TNG films – which is unfortunate, they (the characters and actors) deserve to go out on a good note. Generations is another ok/alright Trek movie. It has some good stuff, like seeing the Enterprise B and how Kirk “died” saving it, Picard coping with the death of his family (dang is Patty Stew a great actor), Picard meeting Kirk – the two most famous captains meeting is a good moment (weird bed & breakfast execution of said meeting aside), the destruction of the Enterprise D, the nexus is a cool idea, and data experiencing emotions (again, though not always the best in execution) is interesting. All that being said, the film does have flaws. It’s not the most interesting, It’s pacing lags, the way Kirk dies is pretty lame, and at points the movie is just straight up boring – which shouldn’t be the case for Star Trek movie. This film was shot and developed simultaneously with TNG seasons six and seven – with a lot of the filming taking place at the same time as the filming for the series finale. We can understand from that the crew were stretched very thin – wrapping up an insanely successful revival show, wanting to (and succeeding in) nailing the series finale, and trying to launch that crew onto the big screen – something had to give – and I think what ended up giving was Generations. Insurrection get a lot of flack, but I like it. It is by all accounts a feature-length episode of the series (with a film budget) and not necessarily a full film – but I don’t think that inherently makes it bad. Sometimes that approach works, and I think it worked with this. The last film (directed by Will “Jonathan Frakes” Riker) went big, this one (also directed by Will “Jonathan Frakes” Riker) went small. It had a nice reference to Worf being on DS9, the scene where Picard ditches classical to dance to some Latin music (the momba) is hilarious, the ethical dilemma of the Federation relocating people without asking is an interesting one (and without the stuff affecting the crew, could have been resolved better), and it brings Riker and Troi back together. The downside is the main conflict is debatably weak, the film might not have enough for people to sink their teeth into, there’s stuff that would work in a Trek ep that might not work as well in a film (looking at you, singing number), it jumps for the action where diplomacy was the name of the Picard game, and they have Riker shave his beard – which is a big no-no. With all that being said though, I still enjoy this movie, and it’s definitely the second best of the TNG films for me. First Contact is not only the best TNG film, but it might also be the best Star Trek film period. It is Wrath of Khan level good. 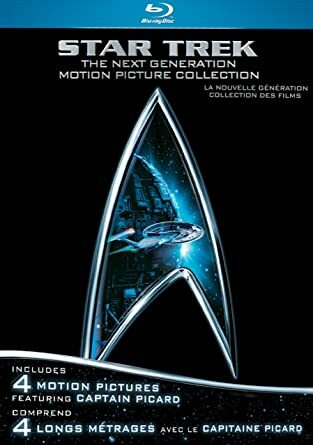 It’s one of the few Trek films you can recommend to non-Trekkies. It’s the note that I wish the TNG movies started on – incase you couldn’t tell, I think it’s fantastic. Incorporating the Borg (best Trek villains), going back in time, Picard becoming obsessed, Riker on earth with Cochran, the Enterprise E looking awesome, the battle of sector 001 at the beiginning, Worf yelling “Perhaps it is a good day to die” and “prepare for ramming speed!” (and in general, the best use of Worf in the TNG films), Lilly, briefly giving Voyager a shout out with the EMH doctor and DS9 a shoutout with The Defiant, Patrick Stewart giving a career performance for his Picard role, the balance with the cast is great – heck Barclay even gets to show up briefly which is awesome. Since I have the list some flaws, the Queen and her impact on the Borg is debatable as to whether it’s good or bad (though I don’t think it’s bad), and the subplot with the Queen seducing Data was OK – not bad, but on repeat of viewings of the film it’s the stuff I’m least interested in. Another amazing thing about this film is the score – the score is beautiful, and one of my favourites from the series. I’m going to end it here cause I can’t say enough good things about this movie, and for me it is easily the best movie of the TNG chapter of the franchise. Next time, we’ll be looking at the longest group on this list/in the franchise – The Original Series era.